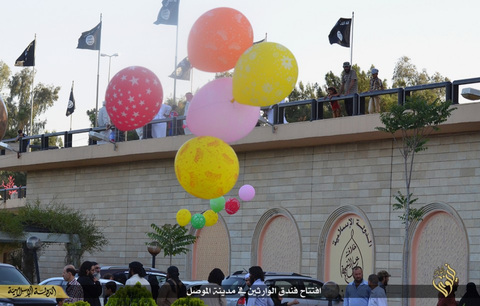 ISIS opened its first 5-star luxury hotel in Mosul. It looks like a nice target. 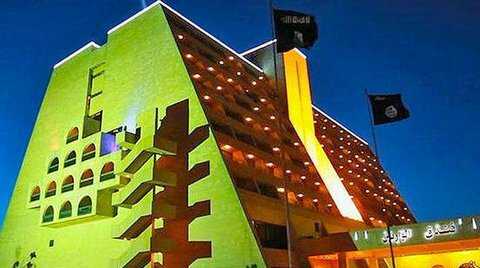 The Ninawa International Hotel was revamped recently by the terrorist groups. The hotel has 262 rooms for rebel fighters. Isis has purportedly opened its own luxury hotel in Iraq’s second city Mosul for members of the extremist group to stay in while visiting. Pictures circulated by Isis-affiliated social media accounts show members tending to a well-maintained garden, polishing floors and cleaning windows, expansive swimming pools and two black Isis flags flying at the front of the multi-storey building. The hotel is believed to be the Ninawa International Hotel, which received a number of positive reviews on TripAdvisor before being overtaken by militants and stripped of its branding. It has 262 rooms, two restaurants, two ballrooms and a gymnasium, among other facilities. The terrorists held their grand opening this week. Black was the color of choice at the hotel opening.